Producer Lauren Shuler Donner was in a tough spot earlier this year. She had three films in various stages of production in the U.S. (Universal’s “Cirque du Freak,” DreamWorks/Paramount’s “Hotel for Dogs” and Fox Searchlight’s “The Secret Life of Bees”) and one shooting in Australia that desperately needed some personal attention (Fox’s “X-Men Origins: Wolverine”). As much pride as she had in her abilities, she knew she couldn’t be on opposite sides of the earth at once. So she did what was, for her, unusual: She turned to her husband, Richard Donner, the veteran director-producer, whose credits include such blockbusters as 1978’s “Superman” and the “Lethal Weapon” series. As the saying goes, no good deed goes unpunished. Before long, Internet wags were speculating that Donner was waiting in the wings to replace “Wolverine” director Gavin Hood. Donner and his wife are good buddies, too — away from work. But their professional efforts for their production entity, the Donners’ Co., are a lot like the stars they’ll be receiving Thursday on the Hollywood Walk of Fame — side by side, separate but equal. During their 23 years of marriage, the Donners have only worked together as producer (her) and director (him) on four films — “Ladyhawke” (1985), “Radio Flyer” (1992), “Assassins” (1995) and “Timeline” (2003). According to Twentieth Century Fox co-president of production Alex Young, another thing that sets Shuler Donner apart is her ability to handle all aspects of production, from development, casting and shooting all the way through to the marketing of the finished product. Donner is known for his unique ability to handle it all when it comes to genres, from horror (1976’s “The Omen”) to juvenile adventure (1985’s “The Goonies”). He’s also renowned for his wicked sense of humor. Donner and his wife like to share the love with both people — “The best thing you can do is get invited to a party at the Donners’ house,” Jackman says — and dogs. “Wherever they are, (stray) dogs find them. At one point, they had 17 dogs,” he adds. Despite their preference for working apart, they’re also there for each other on a daily basis, professionally speaking, providing advice and counsel when needed. “Lauren keeps me in touch with where I’ve gone astray (artistically) because I may lose that insight into a relationship or a romance or something because my male, macho loudmouth takes me in a direction that may skip right over it,” Donner says. Similarly, Donner has provided his wife with insight into the masculine. “If I hadn’t seen how he did action movies, I wouldn’t have had the wherewithal to even pursue an ‘X-Men’ or a ‘Constantine,’ or any of those,” Shuler Donner says. Away from the demands of warring mutants, Shuler Donner still finds time to explore the feminine in films, like her adaptation of Su Monk Kidd’s coming-of-age novel “The Secret Life of Bees,” opening tomorrow. She’s also busy prepping the January release of “Hotel for Dogs,” while ushering “Wolverine” through postproduction. Collectively, the Donners say they could work as a producing team again in the future, but what they really want to collaborate on is a screenplay. “We have one good idea we’d like to try, and maybe we’ll just sit down one of these days and throw things at each other,” he jokes. Don’t they know that if anything can break them apart, it’s the terror of a blank page? Aspiring actor Richard Donner takes a job with a small production company and winds up directing documentaries and commercials. Donner makes his TV directorial debut with an installment of CBS' "Zane Grey Theater." Donner makes his feature directorial debut with "X-15," starring Charles Bronson. It flops. Donner becomes a top TV director, helming everything from "The Fugitive" to "Gilligan's Island." Lauren Shuler shifts gears from being assistant editor of educational and medical films to a camera operator, working on rock concert shoots, sitcoms and TV movies. Shuler is named associate producer of ABC's "Wide World of Entertainment." Donner breaks through as a feature director with the horror hit "The Omen." Donner directs "Superman." Shuler earns an associate producer credit on Motown Prods.' "Thank God It's Friday," after joining the company as a story editor and rising to director of creative affairs. Shuler produces the acclaimed TV movie "Amateur Night at the Dixie Bar and Grill." Shuler produces her first feature, the comedy hit "Mr. Mom." Donner and Shuler fall in love during the making of "Ladyhawke" (1985). Shuler and Donner marry. She produces the seminal Brat Pack film "St. Elmo's Fire." Donner directs the first of four "Lethal Weapon" movies. Shuler Donner produces back-to-back hits, the political comedy "Dave" and the family film "Free Willy." 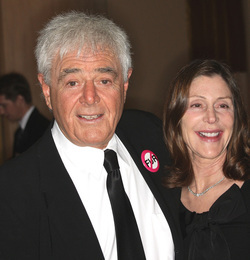 Shuler Donner produces the first of five "X-Men" films. Donner directs "16 Blocks," starring Bruce Willis. Shuler Donner's "The Secret Life of Bees" opens (Oct. 17). The Donners receive stars on the Hollywood Walk of Fame.